Managing your dog's stress is important for his health and the safety of others. Long-term stress can lead to heart problems, stomach issues, hair loss, and more. Short-term stress can cause a dog to bite, run away, or engage in frantic behavior. Chamomile: Helps calm the nervous system, while reducing nausea and an upset stomach. Thiamine Monohydrate: Helps prevent stress-related organ damage. Passion Flower: Reduces muscle spasms and tension. Increases sleepiness and calm feelings. Your Dogs Will Love Them! Simply hand the soft chews to your dog and watch him gobble them down just like a treat! Dogs love the natural bacon flavor, but you can mix the treats into dry or wet food too. During times of extreme stress, dosage can be safely doubled. All production is supervised by a team of veterinary experts to ensure each chew is safe, non-toxic, and effective. We always offer a stress-free return policy. If you're not 100% satisfied, we'll refund your entire purchase price! Don't Let Stress and Anxiety Harm Your Dog! Safe, Effective Way to Keep Your Dog Calm, Relaxed and Happy. REDUCES STRESS AND ANXIETY: Your dog deserves a long, happy life. Stress doesn_t just affect your pup_s emotional well-being, but can have a negative impact on their physical health, too. 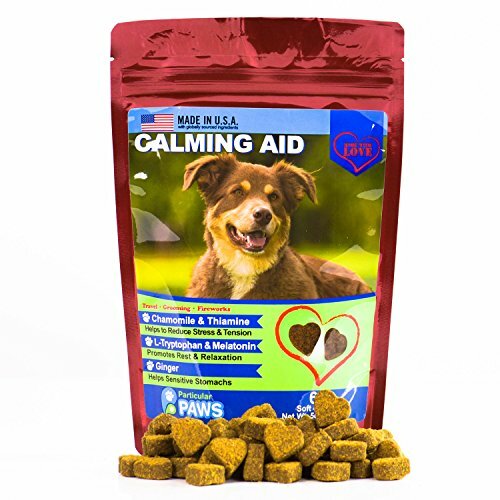 Help your pup stay calm and comfortable during stressful events with our all-natural Dog Calming Aid Treats. By giving your dog one or two of our treats will help soothe their nerves and stress levels. No more anxiety ridden and stressed furry friend for you _ cool, calm, and collected are coming your way! PROMOTES BETTER BEHAVIOR: When dogs are scared, stressed, or uncomfortable, they_re likely to act out in inappropriate ways. Unwanted behaviors can include barking, growling, scratching, chewing and more. A calm, relaxed dog is less likely to harm themselves or their surroundings. ALL-NATURAL INGREDIENTS: Contains no harsh chemicals or toxins. This powerful blend of natural ingredients helps relax the dog_s nervous system while also treating a variety of stress-related ailments. Magnesium, chamomile, thiamine monohydrate, and passion flower help increase cell health while reducing insomnia, gastrointestinal disorders, and general anxiety. GREAT FOR SPECIAL SITUATIONS: Generally speaking, dogs are creatures of habit. Unfamiliar changes can stir up anxiety and stress. Our Calming Treats are portable, fast-acting, and work great in a variety of situations such as trips to the groomer, vet, or dog park. Our treats are also effective for decreasing motion sickness during travel. SATISFACTION GUARANTEED: Try them today for no risk. Made in the USA in a GMP compliant facility for the best quality. If you're not satisfied for any reason, please contact us for a hassle-free refund. Our #1 priority is to make sure you and your furry friend are completely happy!